What We Know About The Suspect In The Nice, France, Attack : The Two-Way Law enforcement and judicial officials have identified 31-year-old Mohamed Lahouaiej Bouhlel as the suspect who they believe plowed into a crowd, killing at least 84 people. Forensic police investigate a truck at the scene of a terror attack on the Promenade des Anglais on Thursday evening in Nice, France. A French-Tunisian attacker killed 84 people as he drove a truck through crowds gathered to watch a fireworks display during Bastille Day celebrations. Law enforcement and judicial officials have identified 31-year-old Mohamed Lahouaiej Bouhlel as the suspect who they believe plowed into a crowd in Nice, France, killing at least 84 people. At a news conference, French anti-terror prosecutor Francois Molins told reporters that Bouhlel was born in Tunisia and living in Nice. He said Bouhlel worked as a delivery driver and was married with children. 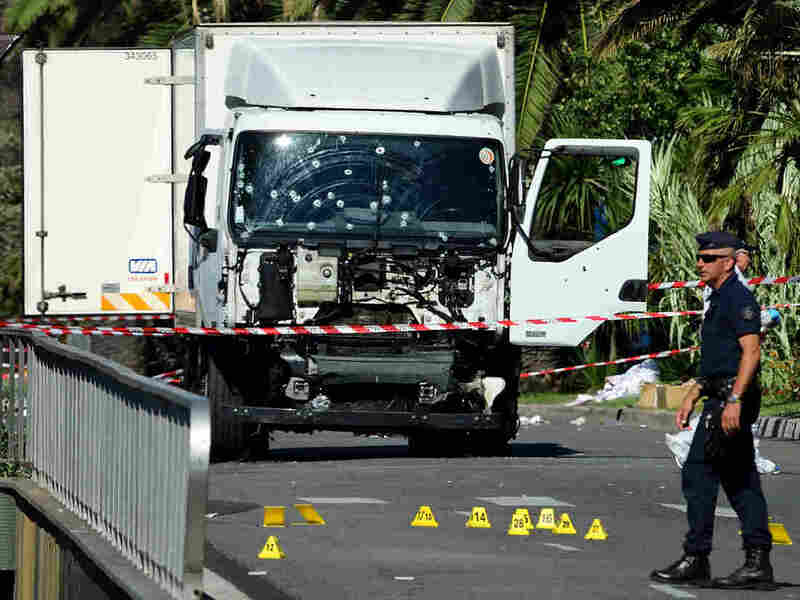 As we reported, an attacker drove a truck into the crowd celebrating Bastille Day for more than a mile along the French Riviera promenade. It ended when police shot and killed the driver. You can read more about the deadly attack here. French and American law enforcement officials told NPR's Dina Temple-Raston that they have not yet found any direct connections between the suspect and terrorist groups. Molins said he was unknown to the intelligence services, and had never been the subject of any kind of screening or showed any indication of radicalization. He was known to judicial and police authorities for cases of assault and theft that occurred between 2010 and 2016, according to Molins. He told reporters that in March 2016, Bouhlal received a suspended six-month prison sentence for an assault that happened in January 2016. Molins said that a driver's license and bank card belonging to Bouhlel were found in the truck. Authorities have carried out searches at two addresses, where they seized computer and telephone equipment. They also took Bouhlel's ex-wife into custody, according to Molins. Officials told Dina that Bouhlel was born in Tunisia and was a French citizen. He also held Tunisian citizenship, spokespeople from Tunisia's Ministry of Interior and Ministry of Foreign Affairs told NPR's Leila Fadel. According to the Tunisian officials, Bouhlel was last in Tunisia four years ago. He hailed from the town of Msaken — 10 miles from Sousse, where an ISIS-claimed attack killed 39 people at a beach resort last year. This is a breaking news story. As often happens in situations like these, some information reported early may turn out to be inaccurate. We'll move quickly to correct the record and we'll point only to the best information we have at the time.